How do you describe a book that really needs to be held, touched, pored over and adored? How do you describe a book that really needs to be seen, not said? 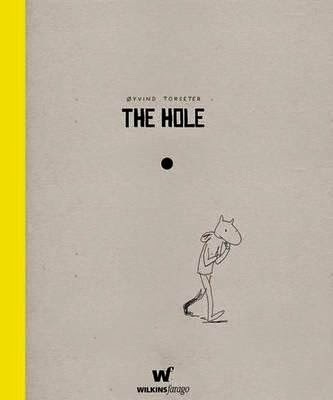 The Hole is such a book. Author/Illustrator Oyvind Torseter is is a Norwegian artist, illustrator, comic book artist and writer. In 2008, he won the the Bologna Ragazzi Award with his picture book Avstikkere, and has received several other prizes and nominations as well for his illustrations. In The Hole, we peek through a literal hole, bored through the centre of the book from cardboard cover to cardboard cover, and via this hole, we not only enter the life of our protagonist (although, arguably, the hole would be the protagonist) we enter his mind. Upon moving into a new apartment, our fellow simply can't explain the appearance of a hole in the wall. Upon inspection, he soon learns the hole is not unique to just one side of the wall, and, depending on the book reader's point of view, that hole can move just about anywhere it likes - to a door, the floor, to the inside of a cardboard box. Carrying that cardboard box, with hole, to a team of scientific specialists for answers, we see that hole appear in the streets as he walks, the traffic lights the eyes and nostrils of passersby. Each and every page, we wonder where that pesky hole will turn up next. And just what, exactly, does this hole end up being? A bug bear? A reminder? Perhaps it's simply perspective - nothing more but certainly nothing a whole lot less. This is an extraordinary book that will have kids boggled and intrigued, and adults thinking. Delectable free-form sketches and monochromatic colour make it visual splendour for any reader. Wonderful stuff.